What Could Be Under The Hat? 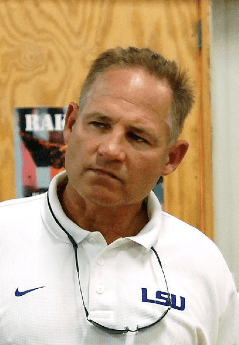 Some of us in Louisiana can’t help but get caught up in the magic of the LSU Tigers and their fascinating coach Les Miles. Miles currently holds a stunning 75-17 record and his success on the field extends to his recruiting, suggesting a mixture of talent in man- agement and leadership, flavored delightfully by his own unique style. In this article, the Times publisher muses about Miles’ unique style, with some ideas from psychology to bring the coach’s magic a little way back through the looking glass. I asked one of our Louisiana experts in leadership, Dr. Courtland Chaney, about the style of Coach Miles. Dr. Chaney is past Professor at the College of Business at LSU, and currently instructor for LSU Executive Education. To look at this characteristic from another view, I decided to run the text of an interview (“Les Miles unfiltered: Arkansas preview,” foxsportssouth.com) through the Linguistic Inquiry and Word Count (LIWC) software so I could get a rough idea of Coach Miles’ communication. The LIWC program counts words and offers a few simple, broad-brush comparisons in its online software. The first thing that popped out is Coach Miles’ high use of social words. The LIWC gave Miles a score on social words of 12.74. We can compare this to the average for samples of formal texts (8.0) and also the average for personal texts (9.5). While not at all scientific, this fits. He does seem to like people and enjoy interacting. Why is social connection important? Trust. Affection. Reciprocal support. Coach Miles really does like his players. He’s not faking it. The LIWC analysis also suggested that Miles focuses on the positive. His interview text had almost double the positive emotion words of the formal or the personal text samples. Coach Miles’ positive emotion words fell at 5.41, compared to 2.6 for formal texts and 2.7 for personal texts. He was also low on negative emotion words. This is a pattern characteristic of optimists. Optimists are normally cheerful and happy. They bounce back more easily after hardships because their positive view makes them more resilient and adaptable. They make up a disproportionate number of leaders in our society because they take risks and seek out challenges. Sounds about right. Great manager, genuine liking for people, positive and optimistic. And there seems to be a little bit of magic too. Psychologists who have studied Ericksonian psychotherapy will recognize this style, called transformational grammar. It is a style with many nuances and variations, depending on the listener and the goal of commun- ication. Here are just two ideas about its benefits. an audience, even a sup- portive audience, increases reactivity. Even if the athlete feels positive about fan sup- port, the supportive audience has a detrimental effect. Coach Miles’ word gumbo seems perfect for balancing out high expectations while at the same time softening the harmful effects of this type of stress. And it likely works because he really means it. Another way that Coach Miles’ word gumbo might be beneficial to his athletes comes from research about “invisible support.” Coaches must give direct advice at times, but research has found that this carries an emotional cost for the recipient, such as feeling less capable. Researchers have found that support can be more effective when it is outside of the person’s awareness or if it is so subtle that it is not perceived as support. Invisible support is associated with lower stress and stronger feelings of capability, what psychologists call self-efficacy. I don’t think this style can be learned, at least not easily. I think it is more of a complex set of characteristics particular to Miles– his concern for people, optimism, integrity, man- agement skills, all coming together. In this way our Mad Hatter seems more like a Zen master, with his natural talents applied to manage high expectations for elite athletes. All the while he keeps his feet on the ground and the grass of Tiger Stadium in his pocket, reminding him that it is just a game, and he, after all, is just a man. Very, very interesting. How did I miss this before? Very smart, and I have learned something today. 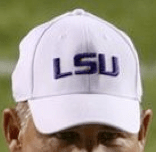 Geaux Tigers and Les…never change! We are so blessed to have a man so mature as our coach and role model for young people. He is a rare individual, as I am sure he would humbly profess human and not perfect but striving to be his best each and everyday not for his own glory in anyway.